The breasts are composed of glandular and connective tissue surrounded by fatty deposits and covered in skin. They sit on top of chest (pectoralis) muscle. You can do these exercises to develop and tone the chest muscles, which will make your bust look fuller and perkier. 1. Bench press/chest press. Lie flat on bench, or floor mat, abdomen tight and lower back flat on bench. Start with weights directly over chest, elbows at 90 degree angles. Slowly straighten arms up without locking elbows, then lower back to start position. On knees or toes, slowly bend arms and lower body until elbows are at 90 degree angle. Slowly straighten arms pushing up without locking elbows. Keep abdomen tight throughout the movement and back straight. 3. Chest flies. Lie flat on bench, or floor mat, abdomen tight and lower back flat on the bench. Start with weights directly over chest, palms facing each other, elbows slightly bent. Slowly lower weights out to side, stopping at shoulder level (do not arch back). 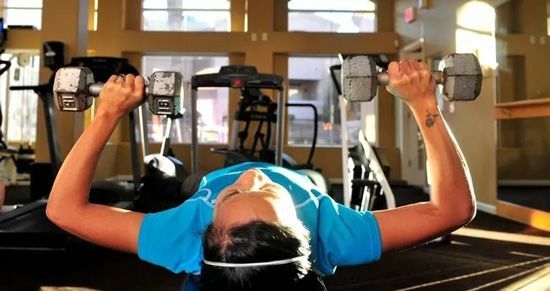 Bring weights back up over chest. Keep arms rounded like you are circling a huge ball.